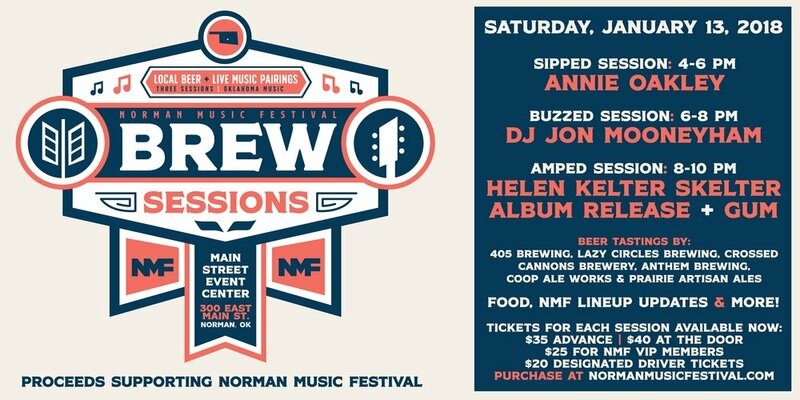 It is scientifically proven that beer and wine can taste better when it is paired with the right music, and Norman Music Festival is here to prove it with the inaugural Brew Sessions on January 13. With three different two-hour sessions, local breweries will be pouring samples of staple and brand new brews at the Main Street Event Center, 300 E Main Street. Tasters will be provided by 405 Brewing, Lazy Circles Brewing, Crossed Cannon Brewery, Anthem Brewing Company, Prairie Artisan Ales and COOP Ale Works. For the first round, Sipped Session, Americana group Annie Oakley is starting the night off and performing from 4-6 p.m. DJ Jon Mooneyham is hosting the Buzzed Session at 6-8 p.m. At 8-10 p.m., Helen Kelter Skelter and Gum are closing the night off at the Amped Session with material from their brand new album being released January 12 at the Opolis. Tickets begin at $25 for VIP members of Norman Music Festival. General admission is $35 and designated drivers are $20. Tickets at the door are $40. Food will be provided by Hideaway Pizza, Pub W and The Garage. For more information, please visit normanmusicfestival.com.